Just like many of you, I am back to work, after a period of holidays...but still waiting for the next weekend for a getaway, and just like every end of summer (it isn't over yet, but you have to admit today it really feels like it) I give even more importance to my beauty routine. Thanks to Clarins, one of my most loved and trusted beauty and makeup brands, I can have all I need for a beauty and makeup routine inspired to the parisian woman: naturally chic, always neat and radiant. This special limited edition box is called "La Parisienne" indeed, it contains five best seller skincare and makeup products in their travel size and it's available on Clarins website at a very interesting price. I am a die hard Clarins fan and when I found out about this box I knew I'd fall in love with it, and so I did, with this bunch of products easy to carry in my pochette, for a trés chic outcome spending just a little argent de poche ! Come molte di voi, sono tornata al lavoro, dopo un periodo di vacanze...ma attendo già con ansia la prossima fuga nel weekend, e come ogni fine estate (non è ancora finita, ma dovete ammettere che oggi lo sembra in particolar modo) la mia beauty routine acquista una maggiore importanza. Grazie a Clarins, uno dei brand di beauty e makeup che più amo e del quale più mi fido, posso avere tutto ciò di cui ho bisogno per una beauty e makeup routine ispirata alla donna parigina: naturalmente chic, sempre in ordine e radiosa. Questo cofanetto in edizione limitata si chiama proprio "La Parisienne", contiene cinque prodotti best seller di skincare e makeup del brand in formato travel size ed è disponibile sul sito Clarins.it ad un prezzo molto interessante. Da super fan Clarins, quando ho scoperto questo cofanetto sapevo già che lo avrei amato e infatti è stato così, con questi prodotti facili da portare nella mia pochette, per un risultato trés chic spendendo pochissimo argent de poche ! A black off the shoulder jumpsuit is the key piece in this outfit post. Readers of this fashion blog rarely see me in black, everybody knows how much I love color, but lately I have been wearing it more often, and this time I've mixed it with pink ! I decided to wear my jumpsuit with Pink Sister pumps from #StayMercury collection designed by my friend Angela Pavese, blogger from Imperfecti.com, already seen in a previous post. These beautiful shoes are made in Italy and still available on Morablu website for a very convenient price ! I have been wearing them a lot because they are super comfortable, plus they are the symbol of friendship…and I love to keep my friends close; the more I think about it the more I realize life is too short to waste it arguing or listening to negative people. Let’s surround ourselves with love ! Una tuta nera off the shoulder è il pezzo chiave di questo post outfit. I lettori di questo fashion blog mi vedono raramente in nero, tutti sanno quanto io ami il colore, ma ultimamente sto riscoprendo il nero, e in questo caso l’ho mixato al rosa ! 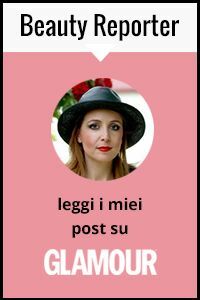 Ho deciso di indossare la mia jumpsuit con le pumps Pink Sister della collezione #StayMercury disegnate dalla mia amica Angela Pavese, blogger di Imperfecti.com, già mostrate in un precedente post. Queste bellissime scarpe sono made in Italy e le sto indossando un sacco perché sono super comode, inoltre sono il simbolo dell’amicizia…e io amo tenermi vicino le amiche; più ci penso più capisco che la vita è troppo breve per sprecarla a litigare o dando retta alle persone negative. Circondiamoci di amore ! How to dress for the beach ? Hey everyone, how are you doing ? I have been spending less time online lately, I am still on holiday mode and I thought it would be my last chance to show you one of my beach attires. How to dress for the beach ? I love short, colorful dresses, especially off the shoulder ones, possibly matching my bikini. A panama hat and a pair of sandals (rubber flip-flops or crossed slippers are a big yes if on the beach, but a no in other environments), big sunglasses and I am ready, I don't need much ! Summer means freedom, hence my only makeup is a touch of hydrating color on the lips, and nothing more. A bunch of magazines in my bag (I have my iPad with me but honestly, under the sun it's not the best option), sunscreen protection and the best company I could have ever wanted: my hubby ! Ciao a tutti, come state ? Sto trascorrendo davvero molto meno tempo online ultimamente, sono ancora in modalità vacanze e ho pensato questa fosse una delle ultime chance per mostrarvi uno dei miei look da spiaggia. Come vestirsi in spiaggia ? Io amo gli abiti corti e colorati, specialmente off the shoulder e possibilmente abbinati al bikini. Un cappello panama e un paio di sandali (infradito di gomma o ciabatte incrociate sono ok per la spiaggia, non in altri ambienti), occhialoni da sole e sono pronta, non ho bisogno di molto ! Estate significa libertà, per cui il solo makeup è dato da un tocco di colore idratante sulle labbra, e niente altro. Un mucchio di giornali nella borsa (ho sempre l'iPad ma onestamente sotto il sole non è l'opzione migliore), protezione solare e la migliore compagnia che potessi mai desiderare: mio marito ! It's time for #DesigualSales, and it's shopping time for me, what to buy ? It's sales time, and as an online shopping fanatic, I have been having a shopping spree on a few online shops, including Desigual webshop, where sales are up to 50%. Some people wrongly identify Desigual only with its signature colorful prints, but the choice is wide and there are plenty of clothes and accessories to choose, even for lovers of monochrome looks. I have bought a few things that are also some of the best choices to buy on sale: an elegant black dress with white details, wearable in different seasons, versatile and timeless, a denim jacket with golden decorations, trendy and comfortable, and a colorful scarf with tassels, one of those accessories that can give a perfect touch to different looks, to bring always in my bag. E' tempo di #DesigualSales e di shopping per me, cosa comprare ? E' tempo di saldi, e da fanatica dello shopping online, ho fatto un bel giro di acquisti sugli shop online, incluso quello di Desigual, dove i saldi arrivano fino al 50%. Alcune persone identificano erroneamente Desigual solo con le sue tipiche stampe super colorate, ma la scelta è davvero vasta e ci sono abiti e accessori anche per le amanti dei look monocromatici. Io ho preso alcuni capi che sono anche, in mia opinione, delle scelte ideali da fare ai saldi: un abitino elegante nero con dettagli bianchi, utilizzabile in diverse stagioni, versatile e senza tempo; un giubbino in denim con applicazioni color oro, trendy e comodo, e un foulard colorato con frange, un accessorio capace di dare un tocco speciale a diversi look, da portare sempre in borsa. - I will never ever enjoy playing with water balloons: you won't ruin my hair blow out so don't you even think about it ! Keep out ! Then, I told you my last minute program for Mid August: nothing too different, relax on the beach, great food, great company...and even this August 15th will be gone quickly, just like every year. Soon somebody will want to know what are we going to do on New Year's Eve, get ready for that because the stress seems to be neverending ! In the meantime, have a great weekend and a great August, 15th, everyone ! - Non mi piacerà mai giocare con le bombe d'acqua o gavettoni come si usa fare: nessuno può mettersi tra me e la piega dei capelli ! Alla larga ! Quindi, vi ho svelato il mio programma last minute per Ferragosto: niente di stravagante, relax, ottimo cibo, ottima compagnia e...anche questo Ferragosto sarà trascorso in fretta, come ogni anno. Presto qualcuno ci chiederà cosa facciamo a Capodanno, tenetevi pronti perché lo stress non finisce mai ! Intanto, buon weekend e buon Ferragosto a tutti voi ! HyperVolume Mascara from italian brand TNS Cosmetics is one of the makeup news I have been appreciating the most lately. I've been a fan of this brand for quite a long time now, first their incredible nail polish and then the lipsticks, and when I found out about a mascara I was so anxious to find out whether it could be as good on my lashes as their other products are. Well, this mascara both adds length and definition to the lashes, adding also volume to our eyelashes, for a sensual bambi eyes look. Thanks to its special wand, with the first step, you have definition and extreme length, and with a second coat you get an incredible volume, without having any clumps or flaking. Defined and volumized lashes, thanks to a formula without Parabens and Mineral Oils. Il Mascara HyperVolume del brand italiano TNS Cosmetics è una delle ultime novità in fatto di makeup che sto apprezzando maggiormente. E' da un bel po' che sono fan di questo brand, per i suoi smalti incredibili e anche per i rossetti, così quando ho scoperto del nuovo mascara ero ansiosa di scoprire se fosse così valido sulle mie ciglia come gli altri prodotti. Questo mascara dona una extra lunghezza e definizione alle ciglia, inoltre aggiunge volume per un effetto sensuale e occhi da bambi. Grazie allo speciale scovolino, infatti, si hanno estrema definizione e lunghezza al primo step e con una seconda passata un estremo volume, senza grumi o sfaldamento. Ciglia definite e volumizzate, il tutto grazie a una formula priva di Parabeni e Olii minerali. Photoaging is caused by sun exposure: this is something we usually don't like to hear, especially in summer, when all we want to do is to lay on the beach, sunbathing and trying to get as tanned as possible. The best ways to avoid photoaging and its ugly effects are to avoid the sun or, anyway, to protect the skin with sunscreen. I have always been concerned with this problem and I never tried to tan without applying a good sun cream before, with a high SPF. Anyway, I noticed most of the damage to my skin doesn't come from my days at the beach: UVA rays hit us also when we go out during daytime, with our makeup on, if we don't apply a good protection. Photoprotection is now easier and lighter with Fotoprotector ISDIN Fusion Air and Fusion Water, two amazing products from spanish skincare brand ISDIN. Thanks to their ultra light, invisible and non oily formula they melt into our skin and protect it from sun damage all through the year. Il fotoinvecchiamento è causato dall'esposizione solare: è qualcosa a cui non ci piace pensare, specialmente in estate, quando abbiamo tanta voglia di starcene in spiaggia a prendere il sole e ad abbronzarci il più possibile. I modi migliori per evitare il fotoinvecchiamento e i suoi effetti dannosi è di evitare il sole e, comunque, di proteggere sempre la pelle con uno schermo solare. Io non mi abbronzo mai senza aver applicato prima una buona crema solare con SPF alto, ma so anche che i maggiori danni per la mia pelle provengono da quando non sono in spiaggia: i raggi UVA ci colpiscono anche quando usciamo per una passeggiata, persino mentre portiamo il trucco, se non ci proteggiamo adeguatamente. La fotoprotezione è oggi facile e veloce con Fotoprotector ISDIN Fusion Air e Fusion Water, due prodotti innovativi del brand spagnolo di skincare ISDIN. Grazie alla loro formulazione ultra leggera, invisibile e non oleosa, si fondono con la nostra pelle proteggendola dai danni del sole durante tutto l'anno. An off the shoulder top is by far one of the trendiest pieces of clothing this summer, and as a lover of trends I couldn't help having a few of them in my closet. I love these tops that leave the shoulders naked, also called Bardot, because they turn even a simple outfit into a summer chic one, they have a holiday mood you can sport even in the city. I wore this striped off the shoulder top with a lace trim on a pair of linen pants, what can be more summery than this ? No doubt, my brand new Robertina XL bag from Roberta Pieri, a made in Italy roomy tote bag in canvas and leather, with exquisite details. This is not my first Robertina tote, I love these lightweight practical bags that are perfect in the city and on the beach and this one, with a geometrical print with touches of blue, brings a bit of sun and sky in my days. A beige panama hat and caged sandals from Le Silla completed my summer chic outfit. Un top off the shoulder è sicuramente uno dei capi più trendy di questa estate, e da amante dei trend non potevo non averne diversi nel mio armadio. Mi piacciono questi top che lasciano scoperte le spalle, anche chiamati Bardot, perché riescono a trasformare anche un outfit semplice in uno summer chic, hanno quel mood vacanziero da sfoggiare anche in città. Ho indossato questo top off the shoulder a righe con bordo in pizzo su un paio di pantaloni in lino, cosa c'è di più estivo ? Sicuramente la borsa Robertina XL di Roberta Pieri, shopper spaziosa made in Italy dai dettagli perfetti, in pelle e tessuto. Non è la mia prima tote Robertina, adoro queste borse leggere e pratiche perché sono perfette sia in città che in spiaggia e questa, dai motivi geometrici con tocchi di azzurro, porta un po' di mare e di cielo nelle mie giornate. Un cappello panama beige e sandali caged Le Silla completano il mio outfit summer chic. I love summer, but it's also the season when our complexion is in danger: sun exposure can cause spots and redness even when using a high SPF cream, that's why I was so happy to find out Teoxane Cosmeceuticals had a new must have product ! Re[Cover] Complexion SPF50 is a high coverage foundation, a hybrid skincare/makeup product that corrects skin tone and imperfections, all with a SPF50. Three different shades can be blended together in order to match any skintone, and in spite of being a high coverage product it grants a natural effect. I have been using it on blemishes, spots and little imperfections with great results - I have to say my skin doesn't has no evident imperfections, but it's good to know such a high coverage product exist. I had been trying other camouflage products and usually they tend to patch on my dry skin, this one contains arnica, vitamin c and hyaluronic acid and it is nourishing and extremely comfortable on the skin. This means you won't be feeling like wearing a mask or your skin won't look dry or dull. A foundation that corrects, repairs and protects that skin all in once, not bad, right ? Amo l'estate, ma è anche la stagione in cui il nostro incarnato è più in pericolo che mai: l'esposizione ai raggi solari può causare macchie e arrossamenti anche se si usa una crema con alto SPF, per cui sono stata felice di scoprire che Teoxane Cosmeceuticals aveva un nuovo prodotto must have ! Re[Cover] Complexion SPF50 è un fondotinta ad alta coprenza, un prodotto ibrido tra skincare e trucco che corregge le discromie e le imperfezioni della pelle, il tutto con fattore di protezione SPF50. Tre tonalità differenti possono essere sfumate insieme per accordarsi con qualsiasi colorito e nonostante sia un prodotto molto coprente garantisce un effetto naturale. L'ho provato su brufoli, macchiette e piccole imperfezioni con ottimi risultati - devo dire che ho una pelle che non presenta particolari difetti, ma è ottimo sapere che un prodotto con una coprenza così alta esista. Avevo provato altri prodotti per il camouflage prima e di solito tendono a tirare sulla mia pelle secca, invece questo contiene arnica, vitamina c e acido iauloronico ed è idratante e molto confortevole sulla pelle, ciò significa che usando Re[Cover] Complexion di Teoxane non sarà come indossare una maschera e la vostra pelle non sembrerà secca o spenta. Un fondotinta che corregge, ripara e protegge la pelle in un colpo solo, non male, vero ? Welcome, August ! Another month has gone, and as ever we have an outfits recap on this fashion blog ! 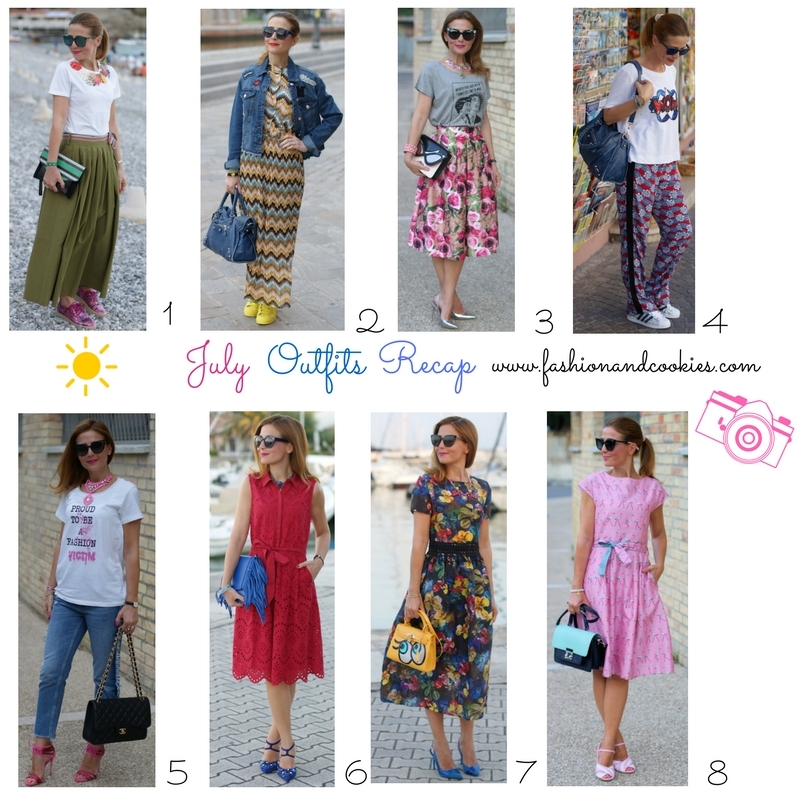 Let's see what I wore on July: I have to say I loved all the looks, we had a few lovely dresses and skirts and this time it's really hard to choose my favorite ones ! Midi and maxi skirts and dresses had a key role, as you know I love them too much ! I am really curious to know your favorite outfit from July and also to know whether, just like me, you are still waiting to go on a holiday ! I have been lucky enough to spend each weekend at the beach, so I have already had several mini holidays after my trip to the Sorrento coast, but I need at least ten days in a row of sun and sea ! Benvenuto, agosto ! Un altro mese è passato e come sempre abbiamo un recap degli outfit passati su questo fashion blog ! Vediamo cosa ho indossato a luglio: devo dire di aver amato tutti i look, con qualche abito e gonna davvero adorabili e stavolta mi è difficile scegliere il preferito ! Gonne e abiti midi e maxi hanno avuto un ruolo chiave, come sapete li amo troppo ! Sono davvero curiosa di conoscere il vostro outfit preferito di luglio e anche di sapere se, come me, state ancora aspettando di andarvene in vacanza ! Sono stata fortunata ad aver trascorso ogni weekend al mare, così ho avuto diverse mini vacanze dopo la mia vacanza in Costiera Sorrentina, ma ho bisogno almeno di dieci giorni di sole e mare senza interruzioni !